I am still waiting on confirmation that the gold stock bull market is underway. A few of the individual stocks are already in their own rally, but the indexes are not yet following along. The HUI, GDX, and GDXJ are all still clinging to their respective upper resistance lines. In all fairness, each of these indexes did make a short-term higher-high today to peek out above their resistance lines, but then each also fell back below by the closing bell. Only XAU index is showing a clear breakout from several days ago and pretty much continues to hang on to those gains. Of the individual stocks that I have been highlighting here, New Gold (NGD) and Sibanye (SBGL) are both in clear breakout mode, and as I suggested previously, I think I can also safely add Yamana (AUY) into the breakout category. Click any chart to enlarge. Primero (PPP) is still consolidating at a (red) secondary resistance line trading in the 0.35 to 0.37 range. I would like to see a clear breakout above 0.37 to show that it is also participating. PPP already broke out two weeks ago (see lower (red) resistance line) but it has gotten stuck in this trading range which is stiffling its momentum. Nonetheless, I believe this is a healthy situation that I am sure will play itself out within the next few trading days. 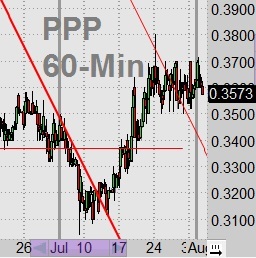 But if instead, PPP breaks out below 0.35 in a decisive way, then it is likely a signal that PPP has lost its momentum and then an initial lower target would be the upper resistance line that turns into support around 0.330 to 0.335. Klondex (KLDX) is still retracing, but I think it is getting close to reversing up. It recently tested the 76% retracement, which I re-labeled last week as a 5 wave structure to indicate up from the low with a 1-2 and a wave 3 expected to get up to the 162% area around $4.53. However, this exact same pattern setup could also indicate a 3 wave structure which would be labeled A-B so far and then wave "C" as a rally to only the 100% area around $3.97. The difference here is if KLDX only gets to $3.97 and turns down, then this A-B-C is corrective which suggests much lower prices are likely, ie: prices going below the recent $2.88 low. 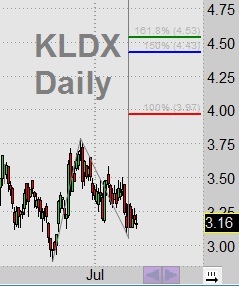 But if KLDX rises higher, above $3.97, then it certainly raises the odds that it will go all the way to $4.53, and then that will be adequate confirmation that KLDX is indeed in bull rally mode. 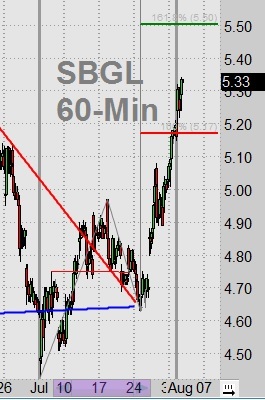 To see an example of what pattern KLDX needs to show, look at SBGL chart above which mapped out a very similar structure and is already moving higher. I am including McEwen Mining (MUX) as another example today because its chart pattern is quite different from the others. There really is not a clear resistance line like most of the other gold stocks and indexes. 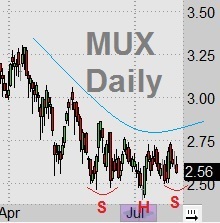 Instead, MUX looks like it is rounding up from its low trading range between $2.50 and $2.70 which looks much more like a traditional head & shoulders formation. 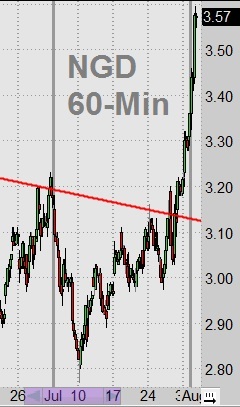 If this continues to play out this way, then the right shoulder could already be completed, but another stab down to $2.50 should not be ruled out. After that the signal will be clear for the next direction, ie: a break lower than $2.50, and certainly below the previous low, would be quite bearish. Fortunately this is a very narrow range from current prices which sets up for a comfortable risk/reward play. But a break above $2.75 is what I really want to see as an indication that MUX has shaken out all of its sluggishness to tag along and rally with the other gold stocks. A minimum upside target would be $3.25 within the next 2-3 weeks before we would want to re-assess anything longer-term. Fundamentally, MUX has a great royalty model with terrific prospects, so I dunno why its stock price has been so lethargic. During the 2016 and early-2017 rallies, MUX was one of the leader stocks in each rally -- so it is very uncharacteristic for MUX to be so range-bound for so long. I already hold some MUX shares, but as this right shoulder plays out I am actively "bottom fishing" in the $2.50-2.54 range hoping to snag a few more shares. If the price breaks lower, then the loss risk on these new shares is very limited. 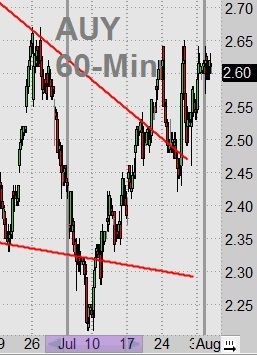 The left shoulder lows were $2.47 and $2.48 and the "head" low was $2.41. So far the right shoulder low is $2.50. Gold stock bull market in progress? While confidence is growing, we're still not there yet.